We took a nice trip to the Hamptons last week (Long Island) and a visit to the North Fork. Those of you who follow me on instagram know my every move. 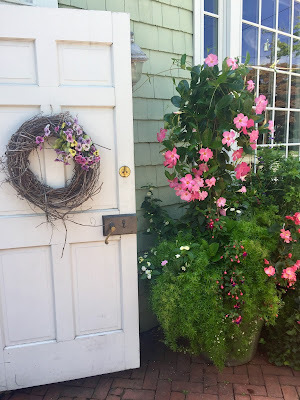 Yes, you will see a lot of movers and shakers on the South Fork (Southampton, Bridgehampton, East Hampton, Sagaponack all the way to Montauk) but who cares about them.....just do your own thing. The North Fork has a totally different vibe. Mattituck, Greenport, Jamesport....all on the Long Island Sound (vs. the Atlantic Ocean in the Hamptons). It's quiet and natural, with a chill hipster vibe. Cool bakeries, farm stands, wineries and agriculture abounds. You choose whichever suits your tastes best. If you like white jeans and Louboutins, then you'll like the Hamptons. If you like jeans and t-shirts and Birkenstocks, then the North Fork is for you. 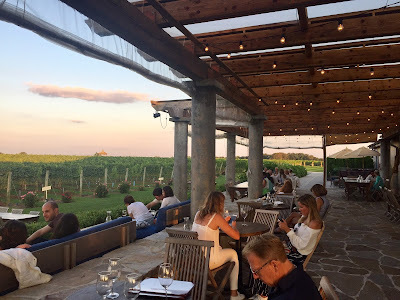 We took a tour and wine tasting at Wolffer Estate Vineyards in Sagaponack .....it really is beautiful, like visiting the Napa Valley on Long Island. Their rose wine "Summer in a Bottle" was super popular this season and is all sold out. A great seat to have some small plates and a flight of wine and watch the sun go down. Silver's is a famous luncheonette in Southampton and serves the BEST BLT on the planet. Served on Eli's toasted bread with summer tomatoes, bacon and mayo. It is probably the best BLT of your life (and mine)....the price tag? $27. But it's HUGE and two people can share it.....and it is the Hamptons......(I am justifying). I am still dreaming about it. Also located in Southampton is Tate's Bake Shop. You can find their delicious cookies in most east coast supermarkets, but here, they are fresh baked, and the pies and cakes are delicious! Get ready to stand in line, and remember, they take cash only. 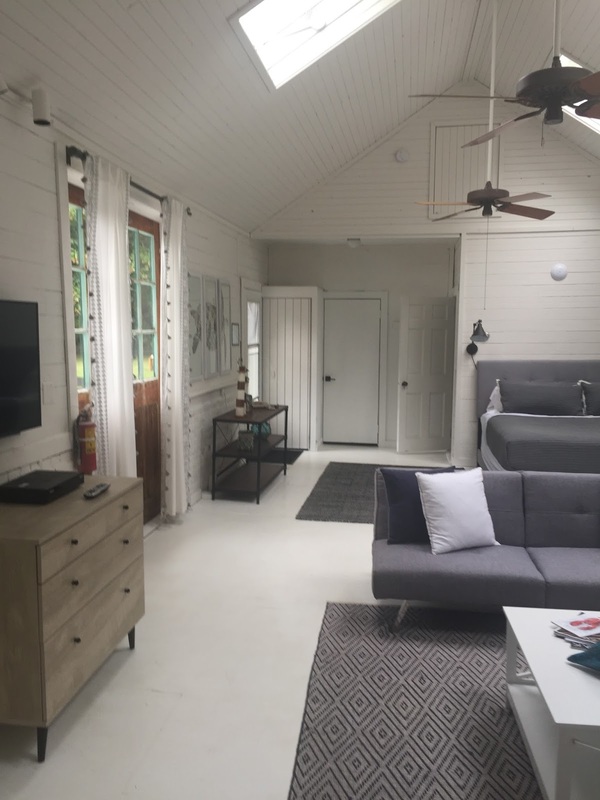 We rented a cool turn of the century potting shed in Southampton for the week, sort of like rustic "glamping" with updated furnishings, daily maid service, and a nice patio to relax and a greenhouse to eat breakfast. Loved it. I always enjoy your travel posts Stacy. Thanks for sharing your trips with us! ALWAYS with lunch while on vacation! I saw the cherry cake with ginger pistachio crumb topping on Instagram. It prompted me to find the "bake from scratch cookbook" on Amazon and I ordered. Looked in the index under cherry cake. I see nothing! Help! I want that recipe badly. I bought the most recent book ( I believe). White distressed wood background, raspberries, cherries spread about. A piece of cheesecake on its side. 3 other of the same, I think, sitting upright. Larger piece of cake with confectioners sugar sprinkled on top. Did I get the the wrong book? Any information would be e great. Thanks!! I made the same mistake so instead I subscribed to the latest issue of the magazine. I noticed the cherry crumb cake was not in the cookbook?!! Don't worry I will get the recipe and posted very soon on my blog! Wow! Thanks for responding so quickly. It's a beautiful book so no problem having it, but now I am waiting patiently, hmmm anxiously for your post. Love your blog,started in 2009 when I got laid off AND broke my leg. It was my relief!!! I went to Southampton College - prime Hippie time '68-'72! There was no better place on earth. I have friends who live on North Fork and it has changed so much in last 5 years but not as much as the south fork. So many wonderful memories - I still get melancholy when I go East. My late husband was born in Montauk (Southampton Hospital). So many memories and yup Silver's was there then and still rocks! What about the Driver's Seat? Always a great burger on an English Muffin.....post beach Mimosa's. I worked in The Post House in Southampton and The Mimosa in Hampton Bays on the beach. The best of times. Glad you enjoyed. What about Sip N Soda? I could go on and on.....from what I remember - those years were foggy!!!! We always pass Sip n Soda, we need to go in next time! It looks so classic! Don't think the Driver's Seat is still there, I would know about that one! Yes, such a great place, one of our favorites any season. Send me your email address, and I will email you a copy of the recipe from the magazine......my friend just sent it to me! I found some Washington cherries today so will freeze them so I can bake this DIVINE cake!